I have a very serious problem. 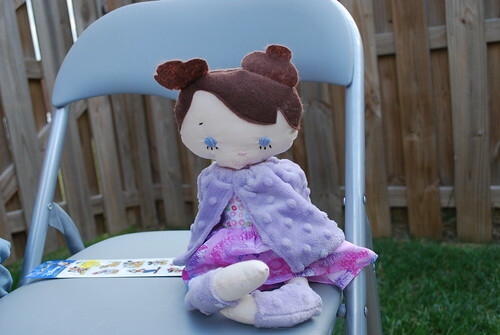 Since making Molly and Joey, I can't stop browsing Etsy and other crafty blogs. 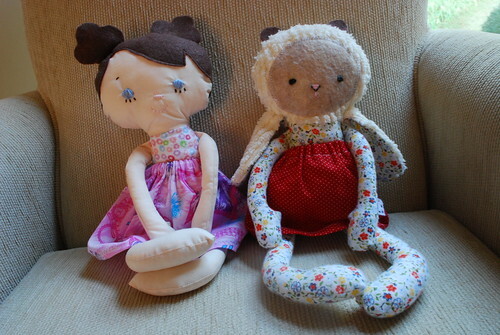 My latest sewing obsession has been these dolls by Bit of Whimsy. For some reason, I want to make everything that I see. So as a result, my daughter has a new doll and my niece received a goat for her birthday. Any excuse to make something. I have thoughts of Christmas presents spinning in my head. There are so many cute things to make and so little time. Sigh. Here's Polly (my daughter named her) and Gertie (that's my name for the goat). 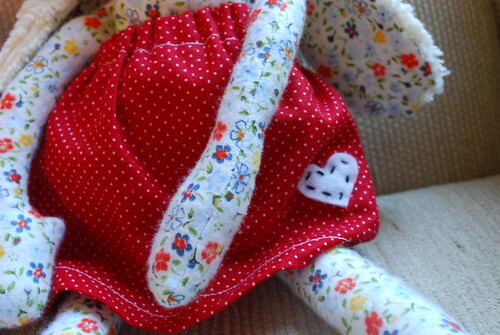 I embroidered a little felt heart on the skirt and a "j" on the goat's bottom for the birthday girl. The photo of the goat's bottom turned out a little weird so I deleted it. You will have to use your imagination. Here Polly sporting her satin lined minky shrug and leg warmers. It was a little chilly out. Harper requested a shrug for herself, but that might be a little too ambitious. Last week I moved all my sewing stuff to the garage and set up a make shift studio so now I can sew when the kids go to bed, which is really nice. Like I said I have a problem. I guess there are worse problems to have, right? Man, those are so cute! If you just can't seem to stop making them, I know a little girl that would love one. ;o) I really do think you should sell them! Oh Jen, Ditto on Christina's comment about a little girl who would love one! Sell them! Sell them! Gertie is sooooo freaking adorable! Oh Precious Polly, she looks great Jen and I love her accessories, "All girls have to Accessorize!" Amazing! Those are so adorable! You have an Etsy store waiting to happen. I do understand. I have found quite a few art projects that I want to use in our homeschool, but my list has grown crazy. The only difference is that we haven't made anything yet. I may try what you're doing and move my sewing to a nice spot in the garage too. I can drop all of the pins I want and leave a mess of projects everywhere, which I do. Plus, the children are learning how to sew now and it would be a great workspace for all of us. Now, how to keep the area warm?